From an early age, healthcare was not a career option that Sharon Callahan wanted much to do with. She was exposed to enough of it in her personal life, she felt. 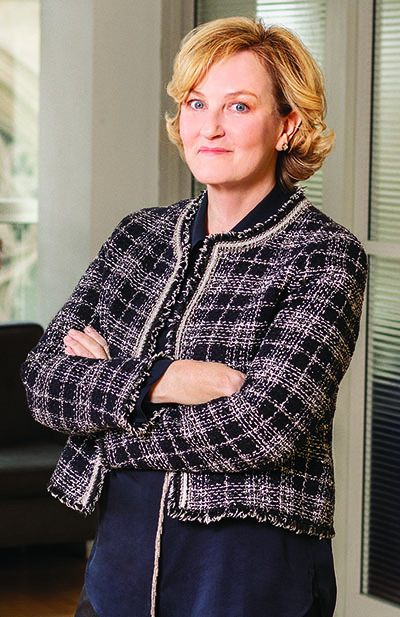 While, professionally, her mother was a nurse and her father had a sales background in the pharma industry, her mother was also diagnosed with rheumatoid arthritis Sharon Callahan, chief client officer, Omnicom Health Group, and CEO, TBWA\WorldHealth.when Callahan was young—and was forced to give up her nursing career. Callahan watched as her mother could no longer function physically as she did before—and be the person she wanted to be—leaving the family to deal with the illness as well. Amid those dueling traumas, Callahan found herself with more responsibilities than a 13-year-old kid should have, helping her father take care of her mother and younger brother. Yet, when Callahan later started her professional journey, she landed in medical publishing first—despite wanting to work in advertising (she graduated from Wheaton College in Norton, MA, with a BA in English). “It was almost like a great accident,” Callahan recalls of her first job, a position with SCP Communications. But was it really? From the very beginning of working in healthcare marketing, Callahan found that she and the healthcare and medical communications field fit like two puzzle pieces. “Within days of being there, it just felt like breathing. It felt like something that I knew and that meant something to me,” says the Connecticut native, chosen as the 2019 Woman of the Year by the Healthcare Businesswomen’s Association (HBA). Callahan stayed at SCP for 14 years, working as a jack of all trades—on the editorial side of medical publishing, in sales, and in marketing. After the company opened a special project division (Med Ed), Callahan became the unit’s general manager. This put her at the forefront of the then-budding digital healthcare arena, and in 1999, Callahan joined Medsite.com to hone her skills further. Medsite.com was like the Amazon.com for doctors, says Callahan. It was an online resource that provided everything from medical reference books to tongue depressors. When the internet bubble burst in 2001, Callahan decided to take the plunge and start her own business, founding The Summit Group. She and her partner licensed a technology called Hyper CD. The technology consisted of a computer CD that connected a to the internet but played video locally. CDs were made up of medical education programs, including series on oncology and Alzheimer’s disease, for example, where s could access live accredited key opinion leaders (KOLs) and experts. The CDs were distributed with medical journals covering specific therapeutic areas. Callahan has faced challenges in her personal life as well. “I am gay. And during my career, even dating back 30 years, I’ve always been very open about it,” she says. “That’s presented some challenges at times.” Additionally, Callahan has two sons, raising them in a climate when that wasn’t very easy to do. She did manage to find a work-life balance, but the “life” part with her family was becoming increasingly more important, and in the late 2000s, Callahan came to a real turning point. Callahan asked her manager if she could work more locally, thinking he would come to an agreement a few months down the road. But, within days, he made Callahan CEO of LLNS (Lyons Lavey Nickel Swift, Inc.), an Omnicom healthcare advertising agency. It was struggling at the time, and the ensuing experience taught Callahan a lot of difficult business lessons. “Everything I thought I knew turned out to probably not be true or right, and I went through a lot of ups and downs with that agency,” she acknowledges. Those same lessons, however, proved valuable when Omnicom, in 2016, decided to merge LLNS with Corbett, another one of its agencies, under the TBWA\WorldHealth brand, where Callahan was named CEO. A month earlier, she was named chief client officer of the newly formed Omnicom Health Group, which aligned the portfolio of healthcare communications agencies under a single management structure. She continues in those capacities today. “I think it might be the hardest and best work I’ve done in my entire career,” Callahan told Pharm Exec. For example, she launched WILDTYPE, a TBWA\WorldHealth company and bespoke agency supporting one of the top immuno-oncology drugs in the world. The product, which Callahan chose not to name, treats various types of cancer with many different lines of therapy. The drug is being studied in clinical trials in combination with other cancer agents, including chemotherapy. “There hasn’t been this kind of complexity in our business before,” says Callahan. To that end, in her role at Omnicom, Callahan works with a fellowship program. She is also involved in advancing the concept of staff “returnships,” where TBWA\WorldHealth has instituted a formal program to better enable returning employees to pick up right where they left off. Drawing from more than three decades in healthcare marketing, serving in management roles of increasing responsibility and scope, Callahan sums up her leadership philosophy in two words: standards and devotion. She holds colleagues to very high standards, and, in turn, is shamelessly devoted to them. Callahan says the best leaders approach employees with generosity, respect, integrity, and truthfulness. “I’ve worked with many people who I just love and adore, but at some point, if they don’t meet the standards that we need to be excellent, and because I care about them so much, I am very truthful to them,” she says. Callahan believes it is critical to give people the freedom to either up their game or decide the role isn’t a right fit for them anymore. She says her biggest passion is “giving a voice to people that maybe haven’t had a voice or can’t have a voice.” Callahan currently serves as vice chair (she will be the chair in 2020) for the LGBTQ Victory Fund, the nation’s largest LGBT super political action committee (PAC), which helps LGBTQ candidates get elected at every level of government. For her personally, marriage, Callahan says, never seemed like a possibility, and she felt out of place in society. But that changed last October, when Callahan and her partner, Taryn, were married. Callahan says she was fortunate to work in digital healthcare marketing during its infancy, and has enjoyed a front-row view of its evolution since. Overall, her predictions for the future of healthcare marketing are rooted in learning how to better anticipate what people will need next. “I hate calling patients ‘patients’ because nobody’s a patient, right? We’re actually human beings, not consumers,” she says. Callahan believes, in brand messaging, that the interests of doctors and patients have traditionally been considered separately—and that approach needs to change. When targeting a doctor, we understand a lot about that person, but often don’t look closely at his or her patient population, she explains. 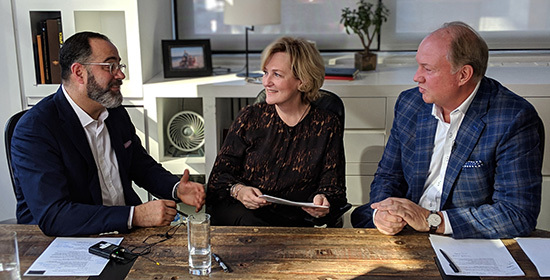 “You could have two physicians that are the same age, with the same socioeconomic status, went to the same college, and so on, but they might have vastly different populations of people that they treat; and we Sharon Callahan, with Ed Wise (right), CEO of Omnicom Health Group, and Joshua Prince, chief marketing officer.haven’t really considered that before [for marketing],” says Callahan. For example, Callahan shares a hypothetical situation, where a lung cancer patient could be on immunotherapy and he or she is willing to try any possible treatment; however, the patient’s doctor may not be forward-thinking or is hesitant to prescribe new lines of treatment—causing what she calls a mismatch. “I think it’s about understanding both sides,” Callahan says, and applying the right custom messages. A future with more marketing customization will be key as treatment advances. For example, Callahan notes that gene and cellular therapy, as well as emerging technologies such as gene editing, require a real need to understand who the patient is and who the doctor is—along with the various impacting factors involved. Those can include patients having to go to specialized hospitals for drug administration, life and job changes, and treatment cost and reimbursement issues.